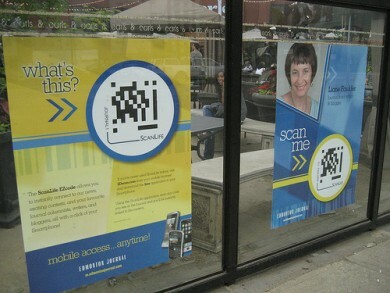 By now you’ve probably seen ScanLife’s codes in the pages of Metro News, Esquire Magazine, Popular Mechanics, Wired, and many more publications. 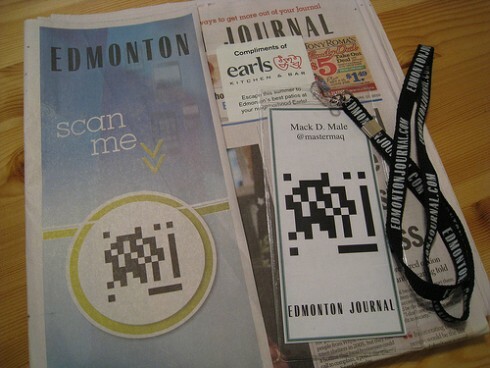 This week, Edmonton Journal, a daily newspaper, introduced ScanLife to their readers with a big splash. They printed a giant code on their front page, placed shelf talkers wherever papers were sold, and even celebrated with a launch party! The codes allow readers to get more info from content like the Bistro section with restaurant reviews and recipes. Each columnist also has their own code so readers can interact and comment on certain stories. Many more applications will be added over the coming days. Here is some video from the launch party. Thanks to Mastermaq for the images and video!